Tech's Tjaden Pallister looks to pass the ball on an offensive drive during the Orediggers Thursday night game against the University of Providence in Butte. Tech's Kaylee Zard drives to the hoop during the Orediggers Thursday evening game against the University of Providence in Butte. Tech's Lana Berg takes the ball to the hoop on Thursday evening in the Oredigger's home game against the University of Providence in Butte. Hailey Crawford is fouled as she looks to pass the ball on Thursday evening during Montana Tech's game against the University of Providence in Butte. BUTTE -- Carly Sanon felt like it was only a matter of time. Injuries, mistakes and All-American center Shay Potter walking away from the team in mid-December had all hampered the start of the season for the Montana Tech women’s basketball team. But the Orediggers head coach has been adamant throughout the season they were close. During a 74-63 upset win over No. 13 Providence on Thursday, her team was finally able to put everything together in Frontier Conference play. It’s the first conference win of the season for the Orediggers who now stand at 11-5 (1-4 Frontier) on the season. Pallister — in just her fourth game back from injury — scored 14 points for the Orediggers, with 10 of those coming in the first half. Wearing a bulky brace on her leg, she logged nearly 31 minutes for Tech and was constantly making plays on the interior. It’s the most Pallister has put on this season, who strained her ACL before the season. She’s not sure whether or not she’ll have surgery on it once Tech is done playing for the year, but the knee is feeling the best it has so far this season. With Potter gone and Faletoi likely missing at least a week, the team has shifted to more guard-centric play and against the Argos, they absolutely shined. Three guards (and four total Orediggers) finished in double figures in what Sanon said was the group's best game this season. Sophomore Mesa Williams led Tech with 20 points, while Mollie Peoples added 15. Williams was absolutely on fire from beyond the arc, going 4-for-6 on her attempts, but was also able to do damage at the rim and the free-throw line. She was especially critical late in the second half when the Argos started to close the gap. 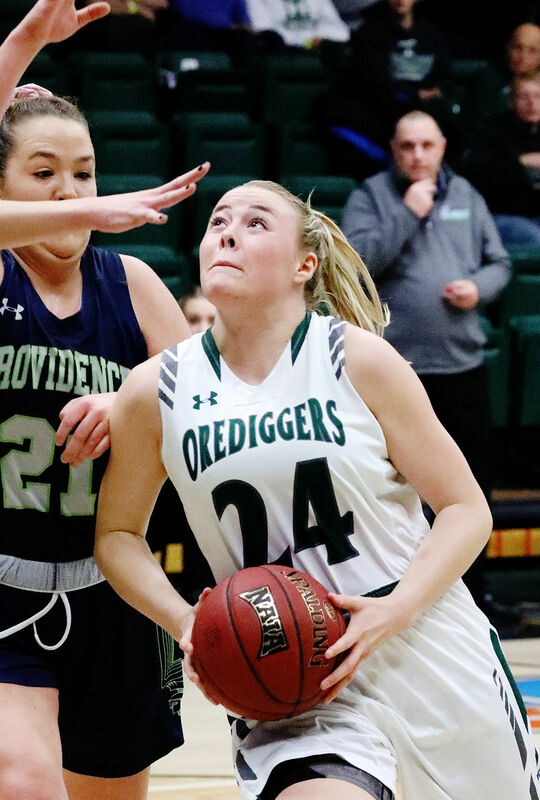 The Orediggers led by 10 at halftime and as many as 18 in the third quarter, but Providence was able to close the gap to just three points early in the fourth quarter. Clutch jumpers from Peoples and Williams helped rebuild the lead and the Orediggers defense was able to limit a talented Providence side over the final seven minutes of the games. Tech also hit 18-of-19 free throws, including a perfect 7-for-7 from post Kaylee Zard, who finished with 15 points. Tech shot 53 percent from the field for the game, though did still finish with 16 turnovers. Star Argo guard Emilee Maldonado finished with 22 points on 22 shots and was just 1-for-8 from behind the arc. Providence struggled from the 3-point line as a squad, hitting just 2-of-20 attempts. Tech played a bunch of zone — of the best zone they’ve played this year — which helped lead them to an important win. Passing for Tech has been phenomenal. Urick ➡️ Peoples ➡️ Zard for the bucket.